The bestselling guide now updated with video demonstrations and audio tracks online The guitar is one of the most versatile instruments in the world, which is why it's so appealing to musicians. 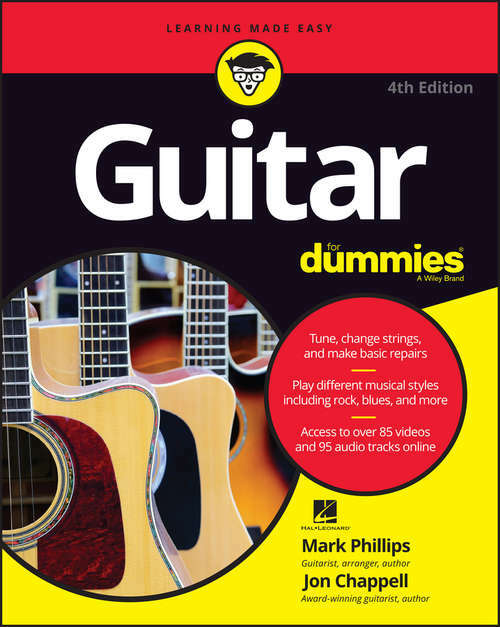 Guitar For Dummies, 4th Edition gives you everything a beginning or intermediate acoustic or electric guitarist needs: from buying a guitar to tuning it, playing it, and caring for it. Fully revised and updated, with online video and audio clips that help you learn and play along, you'll explore everything from simple chords and melodies to more challenging exercises that are designed to satisfy players of all levels. Additionally, new players can dive into the basics of guitar and accessory selection. Whether you prefer the cool sounds of the acoustic or the edgier tones of the electric, your guitar will get a lot of use as you play your way through the lessons presented in this integral book. But your journey doesn't stop at the last page! With an updated multimedia component, you have access to more than 80 online videos and 35 audio tracks that help build your talent. Play along with online videos and audio tracks to develop and reinforce your new skills Tune your guitar, change strings, and make simple repairs to keep your instrument in working order Choose the right guitar and equipment for your needs Explore numerous musical styles, including rock, blues, jazz, and country Guitar For Dummies, 4th Edition guides you in the development of your strumming talent-and who knows where that can take you!